Nawa! That means hello in the Pawnee language. In Oklahoma, thirty-eight federally recognized tribes represent about 8 percent of the population. Most of these tribes came from places around the country, but were removed from their homelands to Oklahoma in the nineteenth century. Their diverse cultures and rich heritage make Oklahoma (which combines the Choctaw words okla and huma, or "territory of the red people") a special state. American Indians have impacted Oklahoma's growth from territory to statehood and have made it into the great state it is today. This site allows you to learn more about American Indian tribes in Oklahoma. First, read the background pages for more information, then go through the biographies of influential American Indians to learn more. The activities section has coloring sheets, games, and other activities which can be done as part of a group or on your own. 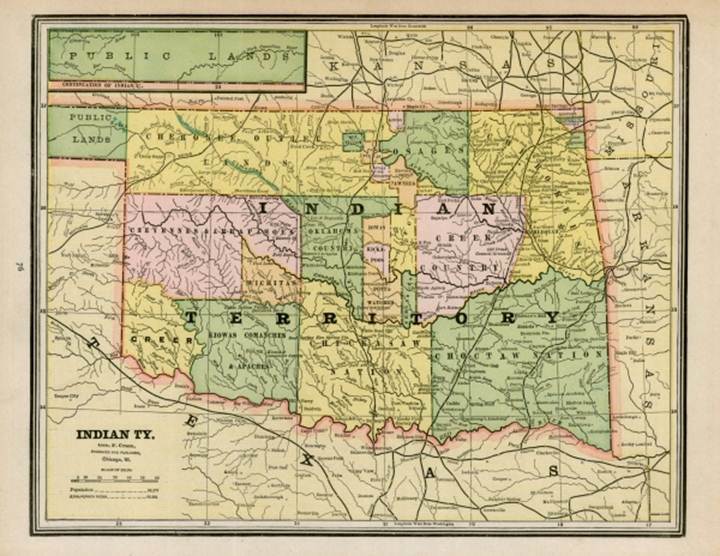 Map of Indian Territory prior to 1889 (ITMAP.0035, Oklahoma Historical Society Map Collection, OHS).